If you're using a paid Subscription and want to be on a free Expensify account instead, you can downgrade to a free account at any time. We want you to feel completely comfortable with how your company is using Expensify before you move forward. If you're not, Expensify gives you the option to downgrade for a full refund after your first bill - no questions asked. If you choose to downgrade a group policy after your first bill, you will be refunded the full amount you were charged and your account will be reset as a free account. Have not cleared a balance in the past. To request a refund, in the web app go to Settings > Your Account > Billing. Scroll down to the Billing History section to find the Request Refund button. 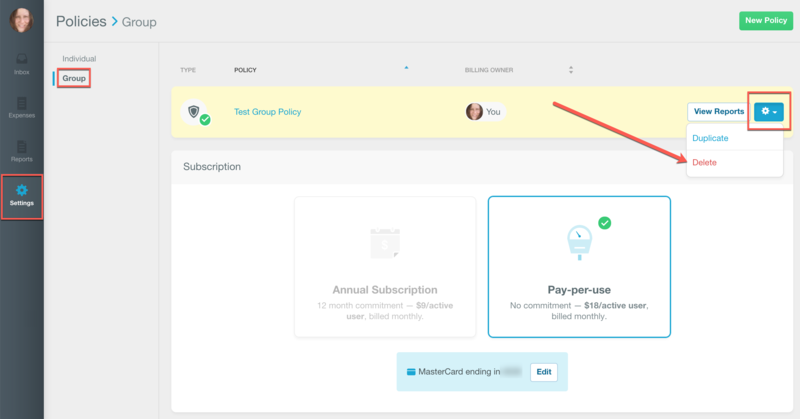 You'll only be able request a refund for your billing history related to group (Collect or Control) policies. Once you’ve successfully downgraded to a free Expensify account, your policy will be deleted and you will see a refund line item added to your Billing History. If you own a Group policy and are on the Pay-per-use Subscription option, you can downgrade at any time with no extra charge. To downgrade, simply go to the Settings > Policies > Group > click the settings button on your policy and click Delete. Note: Deleting a policy removes all of that policy's configurations. All policy members are removed from your policy, though their accounts will not be deleted. To have another admin take over billing responsibility, please follow the instructions here before downgrading. If you are on the Annual Subscription and you are past your first month’s bill, you still have the option to downgrade to a free account. The first option is to wait until your annual subscription expires. Once expired, you can downgrade to free just as though you were on the Pay-per-user Subscription. You can see when your subscription expires via Settings > Policies > Group under the Subscription section. The other option is to downgrade your account before your annual subscription has expired. To do this, go Settings > Policies > Group > click the settings button on your policy and click Delete. 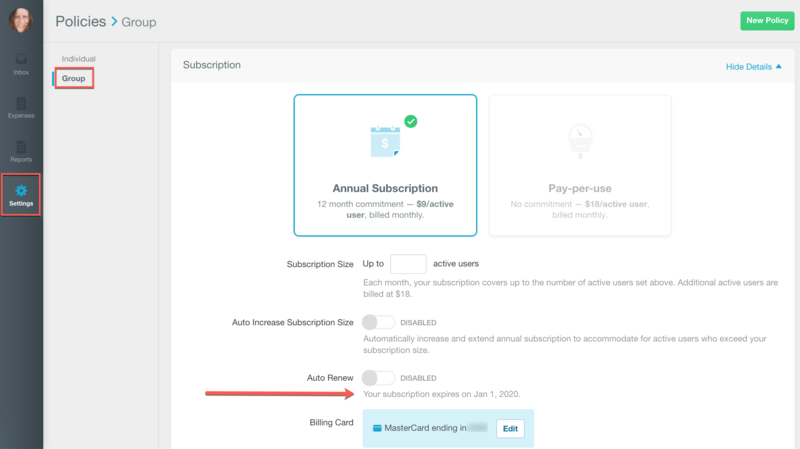 Because your annual subscription has not yet expired, you will be charged a rate adjustment equal to the difference between what you have paid to-date on your Annual Subscription and what you would have paid had you been on the Pay-per-use Subscription. 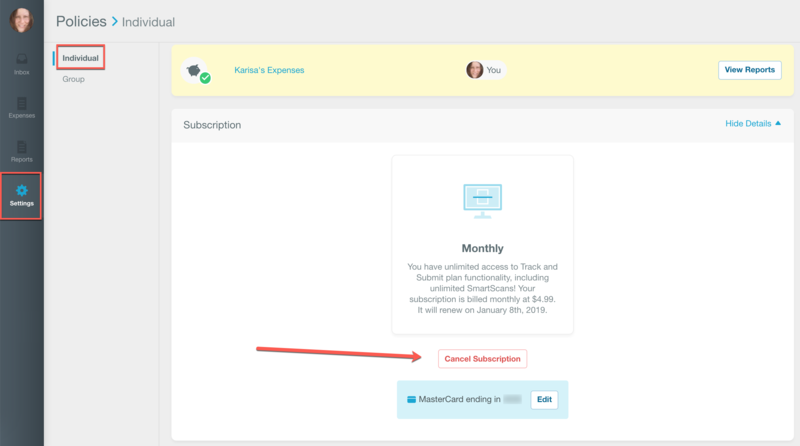 If you've signed up for a Monthly Subscription for yourself as an individual user, and have paid directly via the Expensify web app or Android app, you can downgrade via the Subscription page. To do this, in the web app go Settings > Policies > Individual > Subscription and click Cancel Subscription. If you've signed up for a Monthly Subscription for yourself as an individual user, and have paid via an in-app purchase on your iPhone or iPad, you'll need to manage this subscription directly through Apple iTunes. You can learn more about managing your subscriptions via iTunes on Apple's help site.